Scott Rae: Welcome to the podcast, "Think Biblically: Conversations on Faith and Culture." I'm your host, Scott Rae, dean of the faculty and professor of Christian ethics at Talbot School of Theology here at Biola University. We're here with our guest today, professor Brandon Cash who, among other things, is professor of homiletics and preaching here at Talbot. He also serves as co-pastor at Oceanside Christian Fellowship, but his greatest claim to fame, other than being married to his wife and the father of his children, is that he's the chaplain of the Los Angeles Dodgers. So, Brandon, this is a particularly interesting time of year for you in your role as chaplain to the Dodgers, being in the post-season. So how does being chaplain to the Dodgers, how is it different in the post-season than it is during the regular season? Brandon Cash: Bible study attendance and chapel attendance is higher during the regular season. There's just so much going on with the playoffs and the playoff schedule that the routine is a little different, travel more, but overall, there's a lot of the same. But this is a fun time of year for me. It's when I really enjoy going to the games and getting to see this type of excellence up close more regularly. So it's a lot of fun for me. It's a lot of fun for the players. But the routine gets thrown out of whack a little bit. Scott Rae: Okay. So tell our listeners a bit more about what's involved in your role as chaplain for the Dodgers. And is it basically the same role that other chaplains have with other Major League Baseball teams? Brandon Cash: Yeah. So we have chaplains throughout not just Major League Baseball, but Minor League Baseball and Latin America, even starting in Cuba. And we basically provide chapel service on Sundays for the players, both of our home team and also the visiting team. And then I do a Bible study during the weak with guys on the Dodgers who are a little more interested in growing more in their faith, taking it a little deeper. I have a little more time. It's not as rushed as what we do in a chapel service. Scott Rae: So how frequently do players from the opposing teams come to your chapel services? Brandon Cash: Every Sunday. So if the Dodgers are home and they're playing the Colorado Rockies, then the Colorado Rockies have somebody on their team that I contact. We text them on Saturday and say, "Hey, what time do you guys want to do chapel tomorrow?" And then we'll do chapel with them and the Dodgers. And then if the Dodgers were in Colorado, the Rockies chaplain would do something similar. But the Bible studies are just you're own team. Scott Rae: Okay. So tell our listeners a bit about what kind of relationships do you have with the players that they attend chapel regularly, come to your Bible study. What's the relationship with them like? Brandon Cash: Very similar to the relationship with other guys at church. Some of them, it's more ... they're more have invited me into their life to be a little bit more of an accountability sort of partner. I can ask the tough questions. But I think, probably, just good friendships with guys, especially guys that have been there a long time, the guys that are faithful at chapel. It's just friendships, but encouraging them in their faith and trying to help them walk in their faith in a pretty crazy lifestyle. There's not much for team and what they're doing other than baseball side of things. Scott Rae: Okay. So other than the travel, which is pretty constant for a playoff team to be, what, 180, even with pre-season, maybe even 200 game season. Brandon Cash: Yeah. With spring training. Yeah. Scott Rae: Other than the travel, what other things constitute the craziness that Major League Baseball have to deal with? Brandon Cash: Well, here's the story from this year. I was on the road with them in Philadelphia, and we had one game. So flew in, had a game on, let's say it's Monday night, Tuesday night, and Wednesday morning. So Monday night ... They got in late Sunday night from their previous trip. Play Monday night. Tuesday night there was a rain delay, and the game when 16 innings. And so the buses didn't leave the ballpark to go back to the hotel until about 2:15, 2:20 in the morning. And because Wednesday was a travel day, they had to be back at the field; the buses left the hotel at 8:15 the next morning. And so it's that kind of just in and out, unpredictability of scheduling because of rain delays. I actually think there was an umpire injured in that game, so they had to replace the umpires, or one umpire during the game. So you have that. Brandon Cash: But then, they also have obligations. They put an obligation on the calendar maybe with their agent to do an autograph signing at a sports store. They put that on the calendar three weeks or a month out, and then it just happens with schedule, they've got to go make time to live up to this commitment that when they made that commitment, they didn't have this other stuff on the calendar. Travel plans. You don't know where you're going to be playing in the playoffs, and so they could have been in San Francisco, LA, and then Chicago on three consecutive days, but they don't know that. So that's a whole nother interesting conversation with the team travel secretary. His job is unbelievable, and what he has to do to have planes standing by, hotel reservations in several cities. I mean, it's just crazy. So I guess the uncertainty of what tomorrow's going to bring. Brandon Cash: Yeah. He's amazing. Yeah. Scott Rae: ...and retaining your sanity for very long. So tell our listeners a little bit. What has this season been like? Brandon Cash: This has been a fun one to watch just because the beginning was so awful. I think they had, I don't remember exactly, but I think it was the worst record to start a season since they've come to LA. Brandon Cash: Yeah. They were 13 or 14 games under 500 and totally written off. But they just ... Dave Roberts is awesome with his even keel, very positive, and, "Hey, we've got what we need. It's eventually going to catch up. Things are going to balance out, and we're going to be alright." And he really maintained that the whole time. And so to watch that behind the scenes ... And people hear that in the media, but it really is what happens behind the scenes. Dave's just a real positive guy, kept that attitude. And to see them start to hit their stride in September and really finish with one of the top two or three records on September, and now kind of rolling into the playoffs. Yeah. So that's been fun to see. Brandon Cash: It's been fun to see guys like Max Muncy, who was not on anybody's radar last year. Chris Taylor kind of had that role. And he comes out and hits 35 home runs. If he had a few more bats, he would have been the league leader in OPS, which is On Base Percentage plus slugging percentage, but I think he fell a few at bat short or qualifying. Scott Rae: So how, if at all, does your message that you deliver in chapel and the Bible study, how does that change, if at all, depending on how the team is doing? So was your message different in April and May than it was in September of this year? Brandon Cash: No. I try and think of that chapel time and that Bible study time as something constant. And I want them to know that their faith shouldn't be dependent on what's going on in the game. And I think they appreciate that consistency with what the message would be. I think that what changes, maybe, are the conversations individually with players. When things are going tough, and you can talk with them about that. When things are going good, you can talk about that. But as far as the chapel and the Bible study, we really try and keep that pretty constant based on baseball chapel had chapters of the Bible that we work through each week. And then, I just kind of supplement that in the Bible study. And so we really try and keep that ... I want their identity to be in Christ. I want them to understand God's Word, and their walk not sort of fluctuate with their batting average and winning percentage. Scott Rae: Are the players, are they open to talk to you about the things that they struggle with not only on the field but off the field too? Brandon Cash: Yeah. Yeah. Again, depending on the relationship. And that's one of the things I try and do is build relationships with guys that don't even come to chapel or Bible study just to build a friendship with them. And then when things do come up and they want to talk to somebody, then we already have a relationship established. Scott Rae: So do you end up doing informal marriage counseling, dealing with other types of personal things? Brandon Cash: Yeah. I mean, I have conversations with wives who ask questions, and occasionally go out to eat, or when I'm on the road with them, with the husband and wife, get together. Yeah. I think it really is like I'm their pastor, per se, during the baseball season. So what a normal pastor would ... some of the questions he would field, I get to answer. Scott Rae: So tell me, I suspect a lot of our listeners are particularly interested in how you dealt with the team that came so close to winning the World Series last year. What kind of impact did that have on the players and how you saw that come out? Brandon Cash: Yeah. That was tough. I mean, that World Series, from game one to six was ... I think people were talking about that being the greatest World Series ever. It was just back and forth, heavyweight fight. It was awesome. And then game seven was so anticlimactic that ... yeah. Guys struggled with it, but I think it's a different category if you kind of became the Buffalo Bills where you get there four times and lose four times. I think this time there's still a positive sense, "Hey, we got there. We got to game seven." And I think they were taking the positive out of, "Hey, this was a step forward. We're going to win it next year." And so there was still a hope. We'll see how it goes this year. But yeah, it was devastating for a few days. Scott Rae: Now, you got to go to every game of the World Series last year. Brandon Cash: I did. Yeah, yeah. That was a blessing. Scott Rae: What were some of the fun stories that came out of your traveling with the team? [crosstalk 00:10:21] all seven games of the World Series. Scott Rae: You should talk to your boss about that. Brandon Cash: Yeah. I took a flight out, and it is just funny to be in ... The whole plane was Houston Astros fans. And so to kind of be in that environment, and then to land and to have everybody's a Houston Astros fan. So that was kind of fun. When you're on the road with the team, it's kind of that way. But in the World Series, it's just amplified. So that was fun just being a minority in Houston. Great, great baseball city. Really friendly rivalry. But it was fun just to be in that environment. It was great. Brandon Cash: One of the games, President Bush threw out the first pitch, so got to hang out with two US Presidents just being in the right place at the right time. That was pretty fun. Brandon Cash: Yeah. So it's just all the hoopla that surrounds the World Series. It's kind of fun to be there. There's so much that goes into the scouting reports and the analytics, and especially for a seven game series and the amount of ... I just really appreciate these are really smart guys that are really putting a lot of work in. And to see that game plan come together and see guys carry it out, it's just fun to see that kind of ... I mean, they're the best in the world at what they do. Scott Rae: I was going to say, what's that like being that up close and personal with some of the best players in the world doing what they do? Scott Rae: You might have to deal with all 3,000 of those. Brandon Cash: Yeah. Yeah. Yeah. And so it's just it really is cool to see the work that goes in to be able to pull it off and make those split-second decisions second nature, that they're not even thinking about it, they're just reacting. And yeah. I just love seeing that and being that close to the game to kind of see the behind the scenes stuff that goes on. Scott Rae: A lot of time when you're at the stadium just hanging out with players, building relationships, maybe doing the Bible study or doing chapel, you stay for the game. And are you around the players after the game? Brandon Cash: ... and I'll be in that line. Scott Rae: [crosstalk 00:13:25]. Oh, nice. Brandon Cash: Yeah. So that's usually where I am after a game. Scott Rae: So yeah. I take it there are a number of new players that were added to the team this year. Are some of those new players believers, and if so, are they public about their faith? Brandon Cash: Yeah. So there's been a huge turnover. Kenley Jansen and Clayton Kershaw were the only guys from the original 40-man roster when I started. Scott Rae: And you started how long ago? Brandon Cash: 2011 was my first season. So this is my eighth year. Scott Rae: That's a lot of turnover. Brandon Cash: Oh, it's incredible. Yeah. Especially the last two years, there's been a lot of turnover on that 40 man. Scott Rae: So you just ... You're constantly building relationship. Brandon Cash: Yeah. Yeah. And that's ... yeah. That's tough because everybody in their world wants something from them. And we're trying to go in and say, "Hey, we're here to serve," but it takes a while to build that trust. And so that's where having the relationships and credibility with guys who have been there for a couple seasons give you kind of some credibility. Scott Rae: So that's really a big hurdle to get over? Brandon Cash: Oh, yeah. Maybe the biggest. Yeah. Scott Rae: I never thought about that. Maybe our listeners hadn't thought about that either. Because everybody wants a piece of them for their own self interest. And convincing them that you're not like one of those, on the average, people who's in their lives. Scott Rae: That they're there to give and to serve. Brandon Cash: Yes. Yeah, yeah. And that really helps when you have, again, a coaching staff that's very open and receptive and yeah. Scott Rae: So you've been well received by the coaches? Scott Rae: And by the manager? Scott Rae: ... with the new manager? Brandon Cash: Yeah. Dodger organization's just been wonderful about that. Yeah. So that's been a real blessing because I know that's not always the case. Scott Rae: So who are some of the new players this year who you've built relationships with? Brandon Cash: Yeah. I think Brian Dozier came over from Minnesota. And that trade had been talked about for the last couple seasons. But Brian is a real solid believer, and he came in, jumped right in to Bible study and chapel. Yeah, he's really a good guy. And I'd love to see him back next year, but he's a free agent, so we don't know what will happen. But wherever he goes, he'll be a blessing both to that team and that community. Scott Rae: So you've had pretty consistent relationships with a number of players over the years, who have been pretty public about their faith. Brandon Cash: Yeah. So this year, at Faith Day, Kenley Jansen, Clayton Kershaw, Josh Fields, those guys have been real regular. JT Chargois, he was a new guy that came up this year. And JT's a great guy. He was a Louisiana boy, but fits right in here. Scott Rae: So how do you help the players deal with the grind of their schedule? Is that something you try intentionally to minister to players about? Brandon Cash: Just to talk about it. Try and give them permission to say no. Like, it's okay to say no to things. That's why going on the road with them is a really helpful way to build those relationships because a lot of times their family's not with them on the road. And when we're at home, I don't want to take away from family time. So that's why most of it happens at the stadium. But yeah, I think just trying to be an encourager that setting those schedules, and having some boundaries, and they're not going to ever satisfy everybody. I mean, there's 50,000 people at a game. And they can't sign 50,000 autographs. They can't have conversations with 50,000 people. So just, what was David's prayer? "As for me, I shall walk in my integrity. Redeem me and be gracious to me." Okay, and talk to them about, "Hey, you guys walk in your integrity, and you can't worry about what other people think and what other people do. You do what's right and let the chips fall where they may." Scott Rae: Now, I understand, we've talked before about this, that you're able to do some other things with the players besides your Bible study and chapel. You've got a personal Bible study program that you encourage the players to do. Brandon Cash: Well, Baseball Chapel ... So last year we did that. We did a reading through the Bible, and I was texting them every day. And then, Baseball Chapel's done a great job with a daily devotional. And then, each player ... not each player, but a player each week will video a short message, two to three minutes, that goes out then to all the players in baseball who are signed up to receive it, talking about the chapter that we're going to talk about in chapel that week. So there's been a lot more intentionality within the ministry of Baseball Chapel to try and have everybody on the same page and reading the same things daily and weekly. Scott Rae: Now, I suspect some of the folks listening to this are pastors or maybe church leaders who are thinking to themselves, "I'd sure like to get a gig like this for myself." I mean, you didn't walk up to the Dodgers clubhouse and knock on the door and say, "Hi. I'm Brandon Cash. I'd like to be your chaplain." Scott Rae: How did you get connected to the Dodgers in the first place? Brandon Cash: I was asked to disciple somebody who's on the LA Kings, the hockey team. Their practice facility, Lakers practice facility is real close to where our church is. And so I started having a Bible study and kind of a discipling relationship with one of those guys. And that grew in two or three, four guys, and somehow Baseball Chapel got my name when they were looking for somebody for the Dodgers. But here's a funny story. I don't know if ... I don't know how ... I haven't told this to many people. But I've been a huge Dodgers fan my whole life. And I could sit down on a couch and watch three hours of baseball and not think twice about it. And I got a little convicted of that. Brandon Cash: So this 2010 season I was like, "Okay, we're going to just ..." We canceled our cable and I didn't watch one whole baseball game, like start to finish, that whole 2010 season. And it was in December of 2010 when I get a call, like, "Do you want to be a chaplain?" So I just thought that was kind of funny timing. Scott Rae: Man, I was going to say maybe you better get your cable back and be a little more up to date. So how does chaplaincy with the baseball teams differ from chaplaincy with, let's say, the NBA or the NFL or other professional sports circuits? Brandon Cash: Yeah. So in football, I believe it's really up to the team. I think it's changing a little bit. I think NFLs getting more behind sort of a life coach, kind of help these guys with life and off the field. And so there are some teams that actually have a full-time chaplain, has an office at the stadium or at the practice facility and is with them. I've got a good buddy who's been doing the Pittsburgh Steelers for a while. And he's like a coach on the Pittsburgh Steelers. NBA, I think it's more individual team, if they want it, and a lot less access, I think. I think they do kind of a chapel will be available before the game in a room, and anybody from either team that wants to come can got to that. I haven't talked a whole lot with basketball chaplains. And then, hockey, it's not ... Hockey ministry's similar model. They appoint people to the team, try and recruit people, but it's very much not a presence in hockey. So they're starting to make some inroads, and more people are coming to Christ. But that's a tough soil. Scott Rae: How did it end up being so different, structured so differently for baseball than the other sports? Brandon Cash: I think baseball got its start within. And it's just been around for longer than the other ones. So I think it's just had time to sort of bear fruit, blossom a little. And then it's really a player driven ministry. So you just have players who want to see it happen, who make it happen. So I think that's probably the biggest difference is the player involvement. Scott Rae: Is your ministry different with the players than it might be with coaches or a manager? Brandon Cash: That's a good question. Scott Rae: Or is it fair to say that you have a ministry with the coaches and the manager or is it different? Scott Rae: How's it different? Brandon Cash: Well, there are guys like, I mean, Turner Ward, the hitting coach, I think he's little older than I am, maybe. He's not really 50s. But Turner, I mean, our relationship is just like a great relationship with a brother in Christ. And he's a really mature believer. So I'd say I have good relationships with both. But as far as the chapel ministry and the Bible study, it's more the players. And just because of the coaches schedules, they're often in meetings when we're doing chapel or we're doing Bible study. So with the coaches, it's more one on one conversations, whereas with the players, it's with the group. Scott Rae: Okay. So let's say there's turnover every year in players. I mean, you mentioned Brian Dozier. I take it you've built a bit of a relationship with him already. Scott Rae: He's a free agent. If he ends up, for whatever reason, it's business, he signs somewhere else, how hard is that to just watch these relationships you've invested in ... maybe not like Dozier, for several months, but maybe for several years, and then players are traded, or they retire, or they become free agents and sign somewhere else. But it sounds like you're constantly forming and then letting go of relationships. Brandon Cash: Yeah. Yeah. And that's one of the hardest things. I mean, I've felt it a little bit since I started teaching at Biola is that you have students come in and then they leave. Whereas when you're a pastor, I've been pastoring at my church for 20 years, you have 20-year relationships with people. And so it's a different type of ministry. But I maintain relationships with some ... I played golf two weeks ago with three guys on the Padres. One of them had been a Dodgers for a number of years. So I have those relationships. But that's one of the important things is when they move on, whatever team they move on to call and talk with that chaplain, try and get them connected, open that door for that guy to start building a relationship with the. And so I think we do a pretty good job of giving everybody a heads up when somebody comes to the Dodgers. I got a call from the chaplain of The Twins just giving me some background information on Brian. And so there's a good network there to help with those. Scott Rae: So do you have significant relationships with players that are on other teams? Brandon Cash: Yeah. Unfortunately. I'd love to see them stay with the Dodgers forever, but that's just the nature of the game. And you see the business side of it that is totally understandable, But it is the downside of it. Scott Rae: Yeah. So what, if anything, are you able to do with players in the off season? Scott Rae: So most of the players live out of the area? Brandon Cash: Yeah. Yeah, they go home for the off season. And that's all over the country. All over the world. Yeah. So guys in our town, we get together. Don't have any ... If there's enough guys here and we could do a Bible study, then we would. But most of the time, it's more one on one kind of stuff. Scott Rae: Okay. Just catch it as you can. Brandon Cash: Yeah. Exactly. Yeah. Scott Rae: [crosstalk 00:25:32]. Okay. But there's nothing organized or structured in the off season? Brandon Cash: ... and talking about that. Yeah. Scott Rae: So do you still take them out and smack them around on the golf course? Brandon Cash: Yeah. We played a few weeks ago. Yeah. Scott Rae: Our listeners may not know your background on that. Are you still a scratch golfer? Brandon Cash: No. I don't play enough. I think I could get it back if I played a little bit. But yeah, I don't play enough. Scott Rae: Let's just say that Brandon's better than almost all the Dodgers players that he plays golf with. Scott Rae: Is that a still fair statement? Brandon Cash: Yeah. But those pitchers still have a lot of off days, so there's some good starting pitchers out there. Yeah. Scott Rae: Alright. What's the best story you've got from your time, the last seven years, as a chaplain? Brandon Cash: Oh, gosh. Well, how about if I tell a story that not necessarily baseball, but it was kind of baseball. So because I'm chaplain for the Dodgers, I got invited to speak to College Golf Fellowship, which is a great ministry for college golfers. And Tom Lehman hosted it at his house, who's a professional golfer. And it was a story Tom told, but I think it's illustrative of how things work and how God works. Is Tom was struggling on the mini tours, not even sure if ... living out of his car, not sure if he was going to make it. His wife and he were talking about hanging it up and not pursuing it anymore. And he goes to this tournament, wasn't even going to play in it, but decided at the last minute to play in this tournament. And so he didn't have a caddy. So the course gave him a caddy who was a kid that was a wrestler in high school. Knew nothing about golf, but he could carry a bag. And so he took him. Brandon Cash: Well, the etiquette in golf is if you win a tournament, you give 10% to a caddy for a win. So Tom ends up winning the tournament. And no reason he should give that kid 10% because that kid knew nothing about golf. All he did was carry his bag. He doesn't know he's supposed to get 10% or anything like that. But Tom just felt convicted like, "Ah, I should give him the 10%." And so I think ... It was a mini tour event. I think it was a $30,000 first prize or something like that. And so he gives the kid $3,000. And what he didn't know is that that kid wanted to be a pastor, was hoping to go to a Christian college, but his parents couldn't afford the first payment for tuition. And that $3,000 covered that tuition for him to go to that Christian school. Brandon Cash: Ends up graduating. Now he's a pastor. Scott Rae: That's wild. What an investment. Brandon Cash: So I get to see those kinds of stories from inside, these guys doing so many things that will never get publicized or read about. But you see God at work in sports like that. Scott Rae: Sounds like you've got quite an opportunity to invest in group of individuals that not everybody's got the kind of access to that you do. Scott Rae: And what an opportunity that God's given you for the last seven, eight years, and hopefully for many more years to come. Scott Rae: What's one specific thing that our listeners can pray for you about in your role as the chaplain to the Dodgers? Brandon Cash: Yeah. I think wisdom and God's continued grace. Yeah. Just to know how to minister to these guys. Understanding the role of a chaplain versus a pastor and kind of navigating that and walking that. Yeah. So I think pray for that. Pray for the guys who are believers. It's a world filled with temptation and a lot of difficult sometimes to be vocal about your faith. So just that God would continue to bless these guys and give them the opportunity to be a witness to Christ. Scott Rae: And that they would actually do well in the post season this year. Brandon Cash: Yeah. I mean, if you want to pray for them to win the World Series, I think we'd all be okay with that. Scott Rae: I think maybe the good people in Houston, Boston, or New York might have something to say about that. Scott Rae: Not to mention Milwaukee. But hey, Brandon, thanks so much for being with us on this and for taking this sort of post-season opportunity to talk with our listeners about what your role is like as a Dodgers chaplain. Scott Rae: Greatly appreciate it. Brandon Cash: Thanks for having me. Scott Rae: This has been an episode of the podcast Think Biblically: Conversations on Faith and Culture. 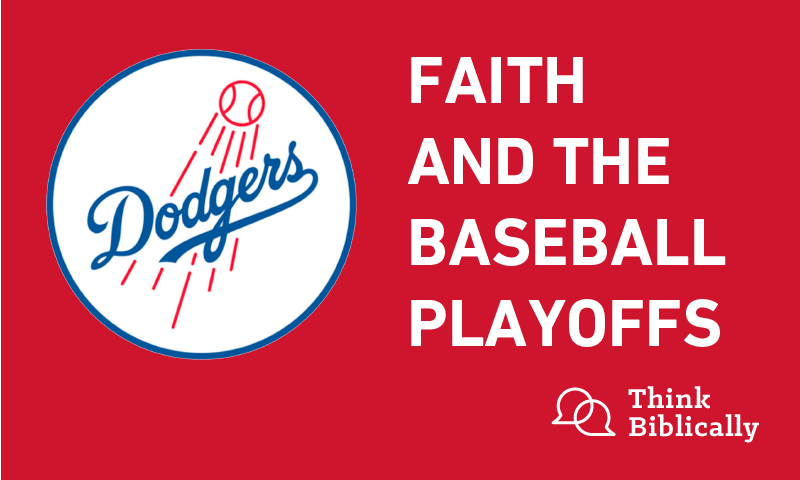 If you enjoyed our program today and want to hear more about it, hear more about our guest, Professor Brandon Cash, Los Angeles Dodgers chaplain, go to biola.edu/thinkbibilically. That's biola.edu/thinkbibilically. If you enjoyed today's program, share it with a friend, give us a rating on your podcast app. And remember, Think Biblically about everything.